Whether you are a history buff, a fan of architecture, a shopaholic or simply curious, Moscow is one of the best places you can visit. Our tours are an ideal way to start your discovery of the Russian capital, as they provide a wealth of knowledge about different aspects of the city. From the Medieval fortress of the Kremlin to the remainders of the Soviet Union, from the underground wonders of the Moscow Metro to the towering cathedrals, we'll show you the best and the most interesting aspects of the Third Rome. 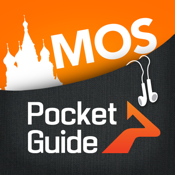 PocketGuide, the world’s leading audio city guide application, reveals the best stories, insider hangouts and must-see sights in more than 100 major cities and tourist destinations. PocketGuide works offline, so you save on roaming charges, and it includes an offline map and loads of critical reviews that help you decide where to eat, drink and shop.